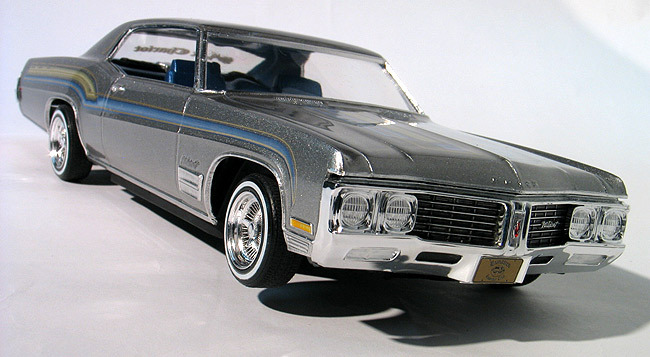 While I was working on the box art for the Model King re-issue of the 1970 Buick Wildcat I got to thinking that it might be neat to build a couple of other versions of this kit once it went into production. I built a stock version for the box art and I thought it was a neat kit. I decided to build 4 additional Buicks to display with my box art model. I thought it would be fun to break away from some of the other types of cars I normally build and try something different. 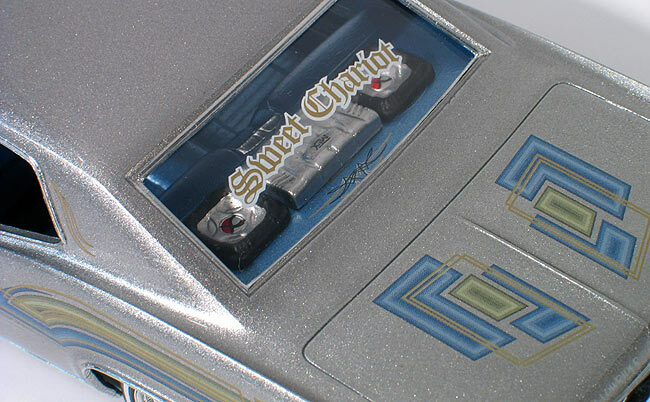 When I designed the decal sheet for the kit I added some low rider graphics, so I thought for my 2nd build I would build an authentic looking low rider and use the decals I designed. 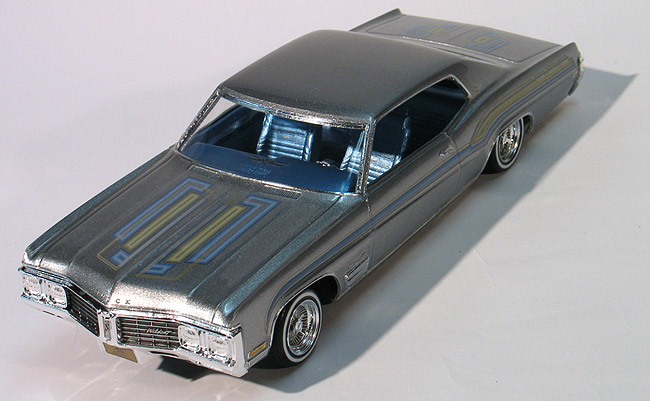 For paint I picked a factory GM silver from Testors new spray lacquer line and shot the body with a rattle can. 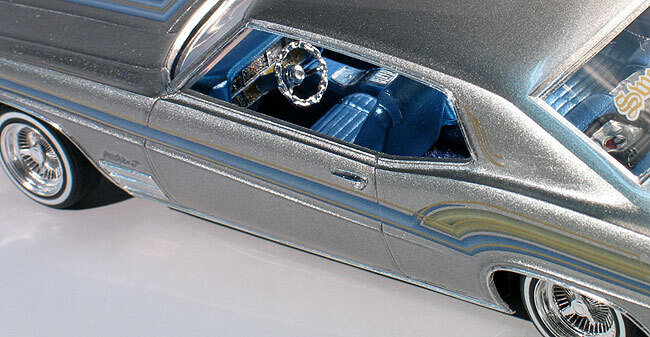 This particular shade of silver has very large flecks in the paint which gives it a very glittery look and is a perfect base for custom paint. After applying the decals I over coated everything with PPG Concept 2000 urethane clear. For the low rider parts I bought a Revell '64 Chevy kit and robbed it for the wheels and tires. A low rider simply has to roll on 14" Daytons. It's the law. I custom mixed a shade of metallic blue that was complimentary to the graphics and sprayed the interior in that color. In addition, I flocked the carpeting in dark blue and added the chain link steering wheel from the 64 Chevy kit. To complete the interior mods, I made a mold from a Dub City die cast car and cast a set of woofers and an amp for the rear package shelf. To complete the look, I modified the chassis so the car would sit dumped in the rear with a 3-wheeled stance like it had hydraulics. While I've never been a huge fan of low riders, I have to admit I really appreciate the craftsmanship put into many of them and I was happy to add this one to my collection.